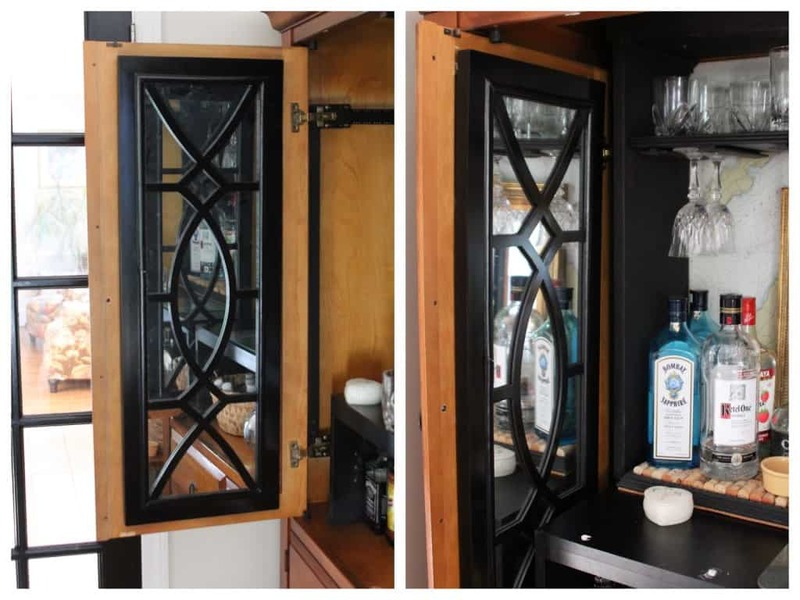 I left you hanging about my bar cabinet that I repurposed from our home office armoire (and a TV armoire before that). The ORC crept up on me and the next thing you know I never came back to tell you about all those wacky odds and ends that comprise the interior of the bar cabinet. and a whole lot of shopping my house. I just can’t stand the thought of filling up landfills with things that can be recyled or reused in some way. On the other hand – I despise clutter. It makes me itchy. It gives me hives. 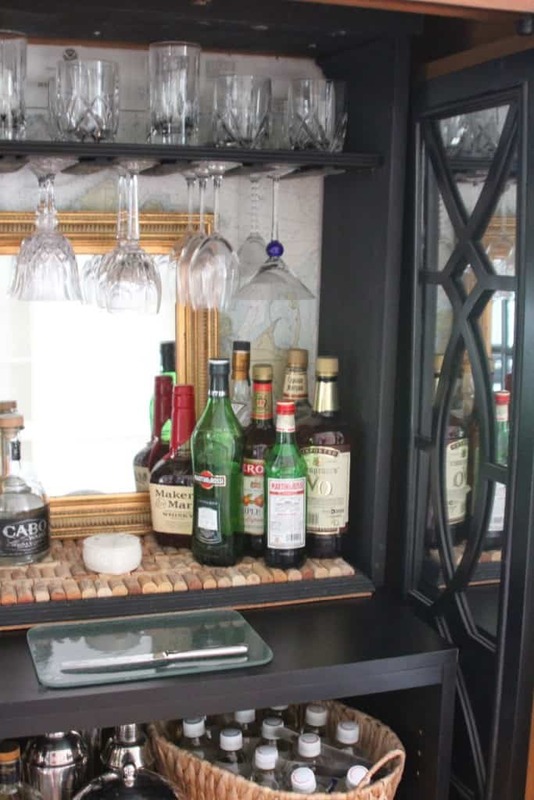 as well as how to make a TV armoire into a bar cabinet. here are some ideas to help you turn your empty piece of furniture into something useful. Here is our armoire – you may recall that it started out as a home for our TV many years ago, then became a dusty landing spot for liquor, and then was used to house our computer and printer. The armoire is made of solid wood and is super heavy, but the back is actually hardboard that had a removable panel to accommodate tube TVs from days of yore. 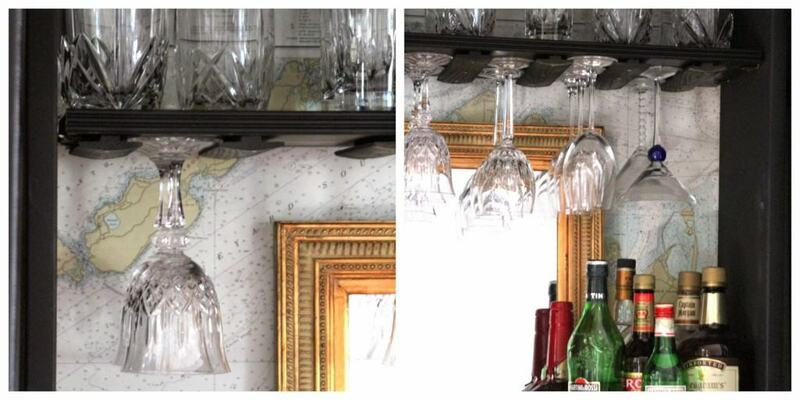 For the bar cabinet, I covered up this big hole with a nautical map. The map = the DIY gone wrong. That was my first attempt to mount a map to insulation, but I used Mod Podge – which as it dried, tightened the piece of insulation and made it warp. 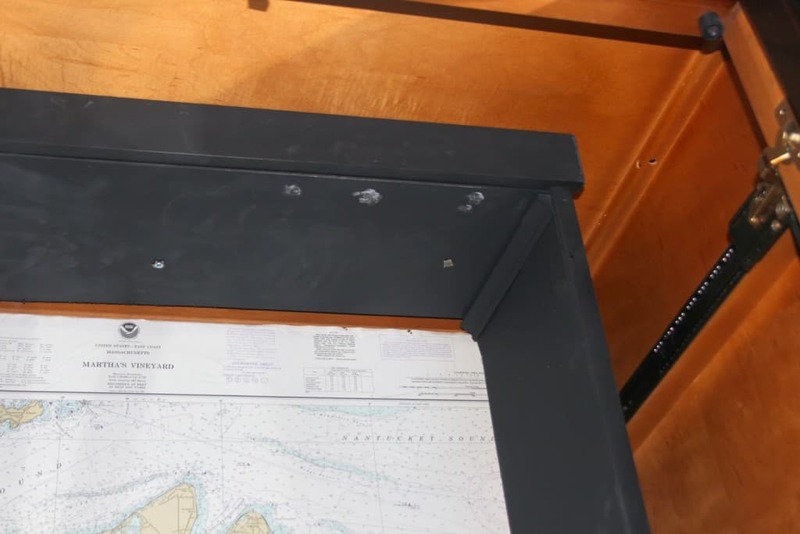 To get my warped map to stay on the back of the armoire, I used Liquid Nails to mount it (L), notching out space for the sliding panel door hardware. Because the map was so bent, I found a few pieces of wood in the garage, cut them and framed out the map by driving finish nails through the trim into the side of the armoire. The warped map turned out to be the perfect fit to cover the big hole. that blew into the woods during a particularly windy storm last year. Next up I took out the shelf inside the armoire that is meant to hold the TV and retrofitted it so that some smaller liquor bottles could fit underneath it. I also cut 2x4s to fit behind this shelf and screwed them together with countersinking deck screws. This maximizes the depth of the shelf. 2x4s = leftovers from bookcase project. Basic building 2x4s are inexpensive at lumberyards. Next up, I built a frame for the upper portion of the cabinet. The upper frame = busted ping pong table top. You could easily build this with lumber. The ping pong table broke about a week after the warranty expired (the base as well as a big crack in the top! ), and I always thought I would be able to fix it or make a new base for it. Instead it has sat in our garage for two years, where it incurred serious water damage from snow dripping off our cars. However, I still couldn’t bring myself to throw it in a landfill. I figured the particle board would come in handy for something, someday!!! Mark was VERY skeptical that this structure would be sturdy, but with a few screws attaching each corner together, plus two L-brackets on each corner, it is actually quite strong! This ping pong table frame was not very attractive, so I filled all the nail holes, added a bit of trim to hide any uglies and reinforce the corners, and gave the whole structure a quick hit with black paint. The trim = leftovers in the garage, including this bent piece that I have no idea why I saved. The trim is not necessary to this project if you don’t have any leftovers around your house. I screwed the top of this frame into the top of the armoire, making sure to use screws that wouldn’t go all the way through the exterior of the armoire. Next I added a shelf to this upper portion of the cabinet for barware. The shelf is hung on shelf clips that were inserted into holes I drilled into each side of the frame. On the bottom of the shelf I installed pieces of T moulding to hold wine glasses. I found this idea online ages ago and have been dying to do it. This would be great for wine glass storage inside your cabinets, or underneath them!! 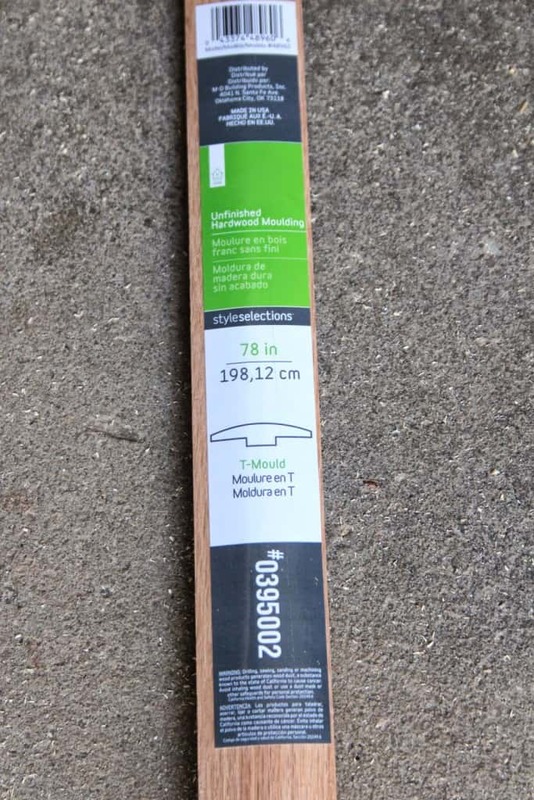 T moulding is used for flooring transitions (for example, from hardwood into a carpeted area) and can be found in the flooring section of hardware stores. This single piece alone was $15, but represents the only purchase I made for this project, and I think it is my favorite part! 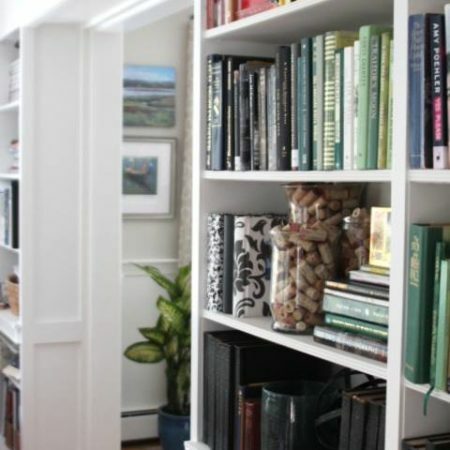 Trim on outer edge of shelf = leftover from bookcases and again, not necessary to repurposing an armoire. 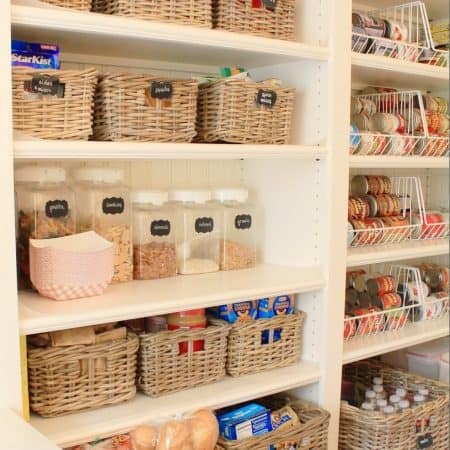 I also measured to make sure that I could store glasses ON the shelf, and UNDER the shelf, as well as fit bottles of liquor BELOW the hanging glasses. 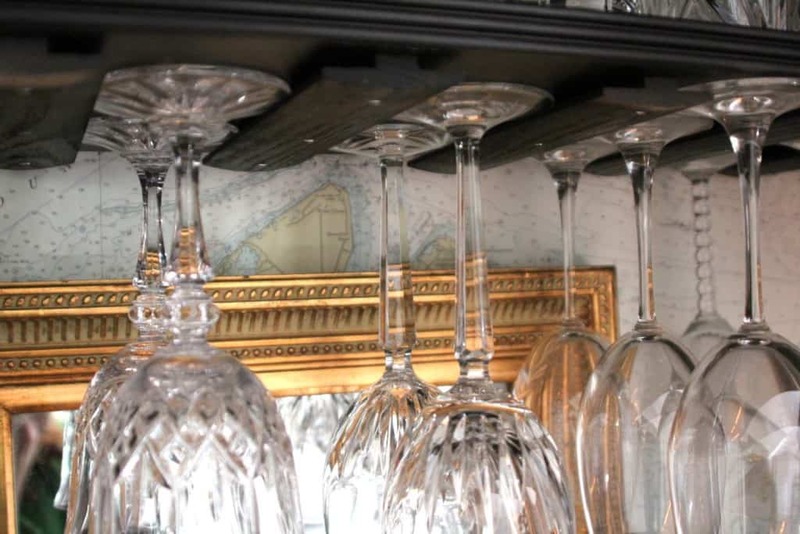 Did you know you are not supposed to hang “good” crystal or barware from their footed base? Oh well. I love our crystal and I want to enjoy the site of it when the bar cabinet is open! shopping the house. Best kind of shopping – it’s free! The wine cork tray I made was the absolute perfect fit. It was a must! The Belleek ring box was an engagement gift from one of best friends many years ago….it holds wine charms. The gold mirror came off our black & white gallery wall where the bookcases now are….. 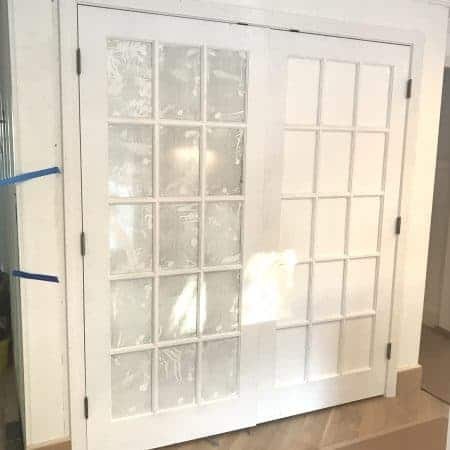 The mirrors on the doors where stolen off my living room walls, hung on small screws on the thickest part of the door. The doors slide into the side of the armoire so they reflect the crystal and pretty bottles. 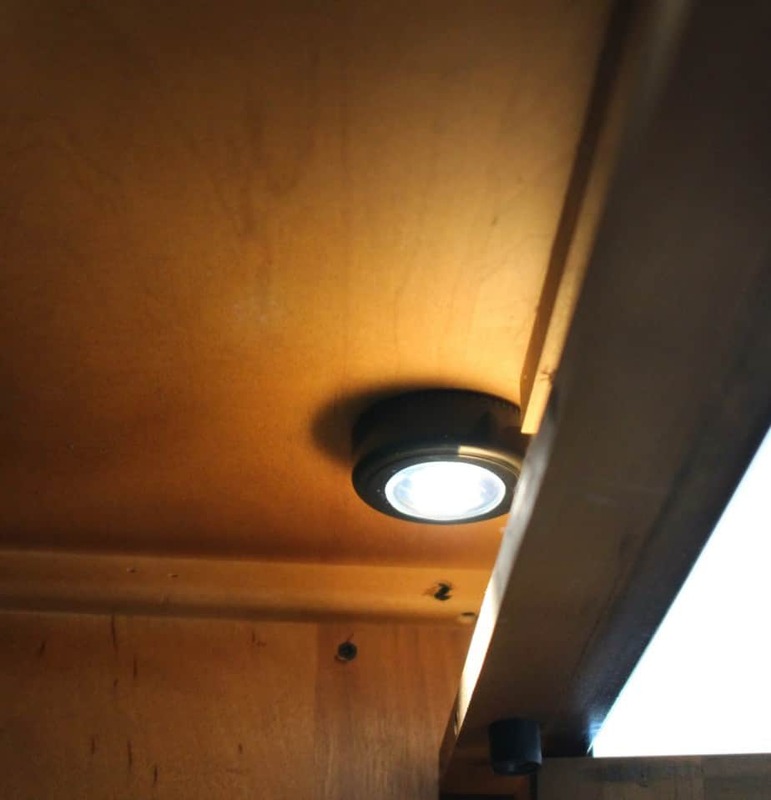 Three puck lights were mounted inside the very front of the armoire with the double sided tape they came with. They are battery operated and perfect for this space. Puck lights are available at hardware stores starting around $10. 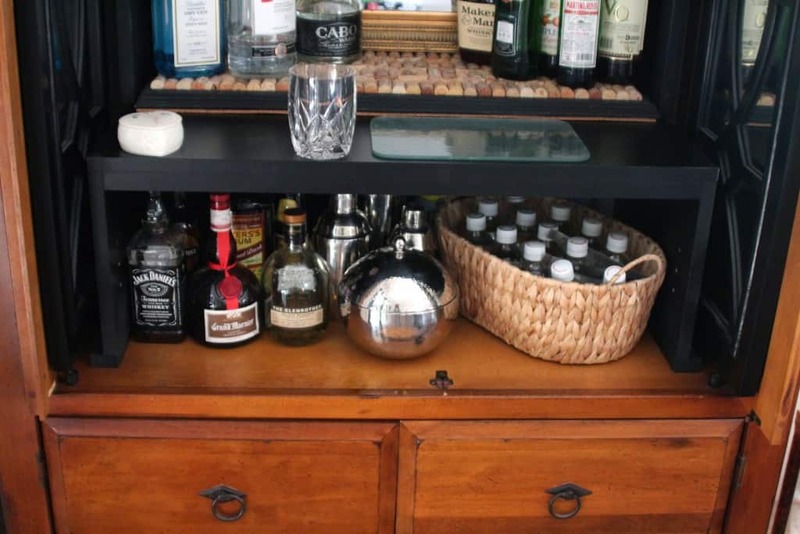 There is plenty of room for liquor, club soda, tonic water, shakers, and the ice bucket. 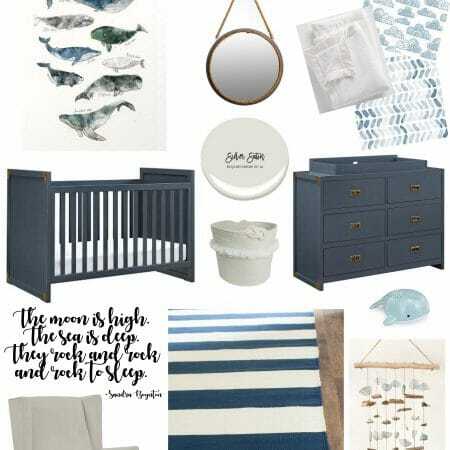 I love that everything is all in one place now. So there you have it friends……how a bunch of junk came together to serve a new purpose! What have you or can you save from a landfill and give new life to? And if you have any great ideas on how to repurpose the other three sections of the very large ping pong table, I’m all ears!! The miter cut magic trick that I discovered, coming up next! This is awesome! I agree, I don't like to send items to the landfill and tend to think everything can be upcycled. Much more simple than your project, but I took a broken picture frame and turned it into a tray for my bar cart. You are a re-purposing carpentry rock star! Way to think outside the box and come up with an awesome end result, Lisa! that is one mad upcycle, my friend! looks awesome and way to save that landfill! You are the queen of resourceful!! This is such a great project and so perfectly functional for your needs. 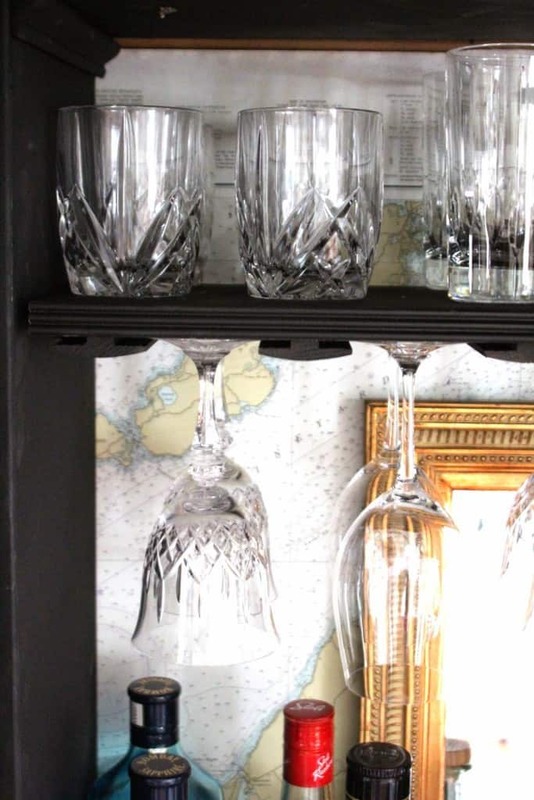 I'd love all my glassware, liquor and bar accessories in one place chic place, too! Great ideas Lisa! It came out so beautiful! You amaze me with your creativity! 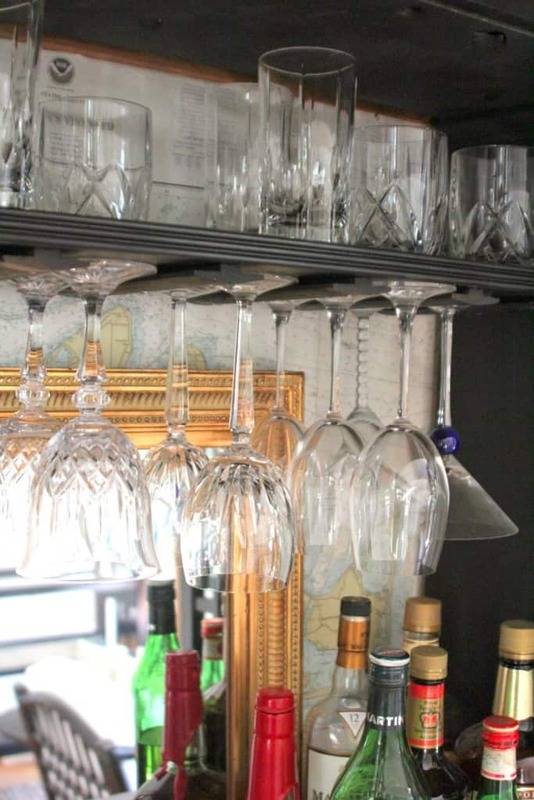 I'm loving that idea of the T molding to hold glasses – so functional and it looks great in your bar!! This is so smart. 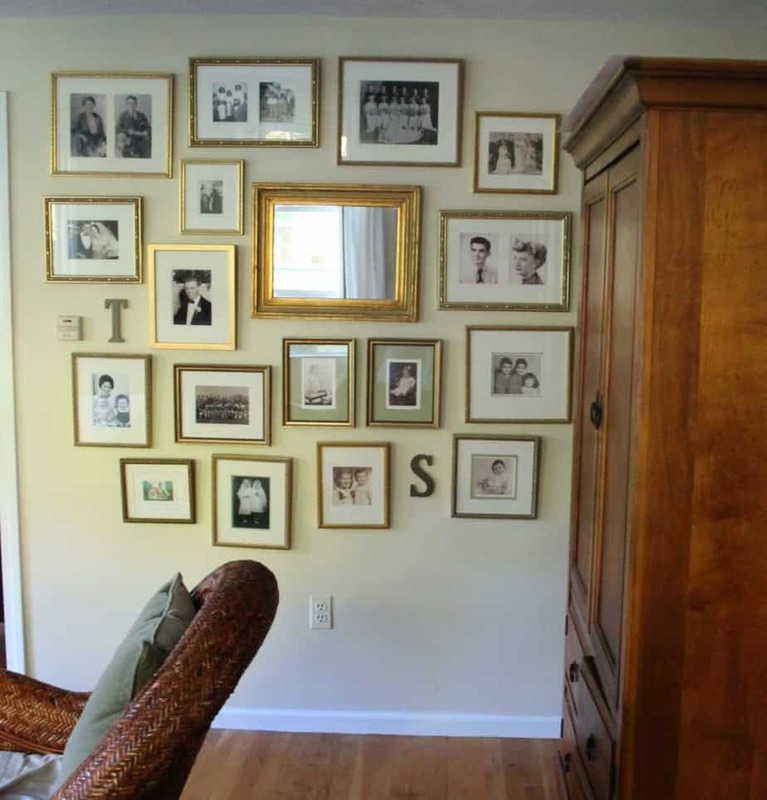 I love the T molding idea. How clever you are, my land fill saving friend! Lisa, you are so creative! I love all the pretty touches and what a perfect wine cork tray! This is so creative. You amaze me and I love this. Brilliant! You are the queen of upcycling chic! Love how functional this little armoire's been in your life..LOVE that map idea, definitely pinning! So clever Lisa! 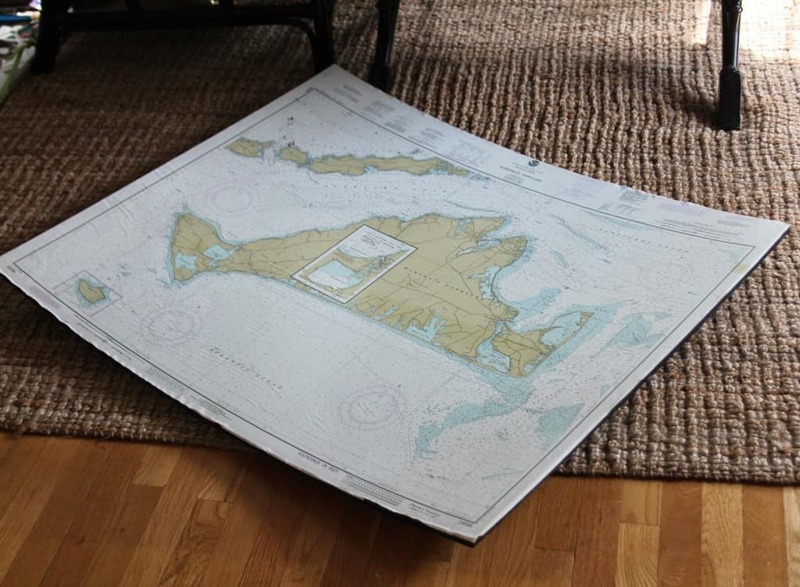 My family and I go to Martha's Vineyard every summer- so I recognize that nautical chart. Last summer, I put a nautical chart behind a bookcase and it looks so cool. 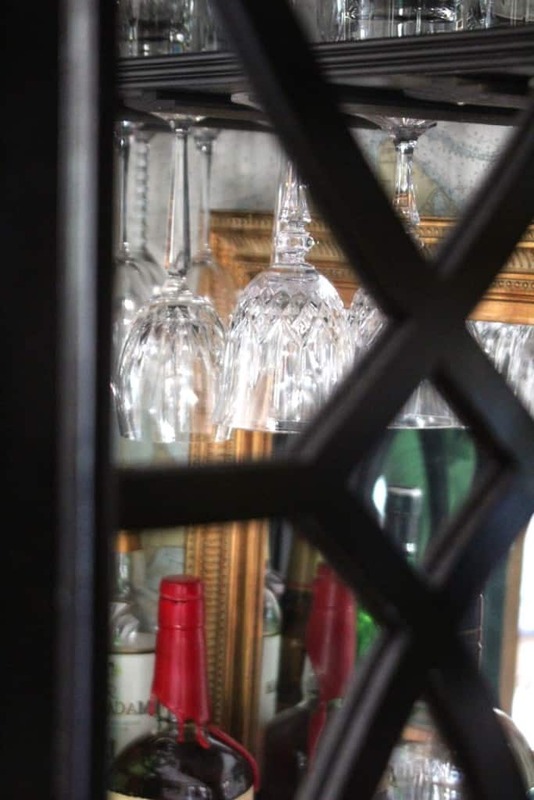 I love all your details in the cabinet with the mirror and hanging the stemware. Great job! I love your repurposed cabinet. I have a built in armoire/tv cabinet in my living room – when the moon and stars line up :), I plan to put the TV over the mantel and make the armoire a bar cabinet. 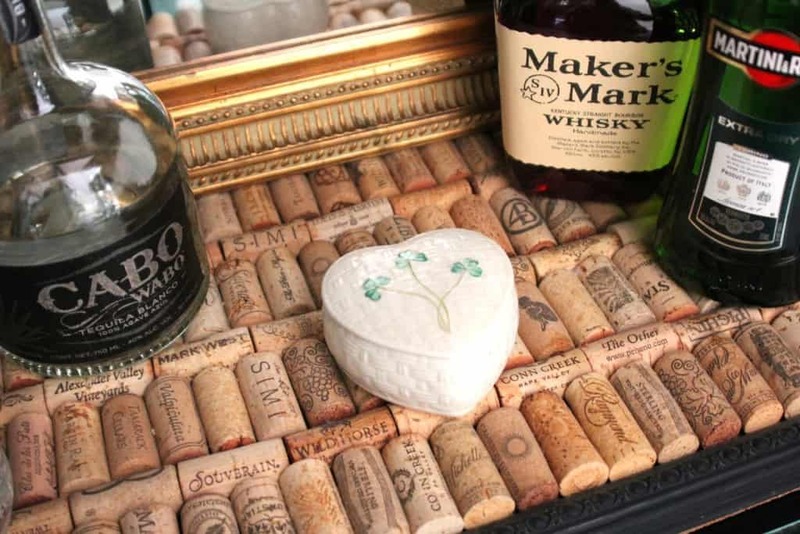 I LOVE your cork tray! I am going to start collecting corks and make one for my area! Great idea! Being resourceful and a friend to the environment is something you should be very proud of my dear Lisa, I'm like that too, although, since I don't have any carpentry skills at all, I end up accumulating stuff in my garage which hopefully, my hubs can use for future projects. 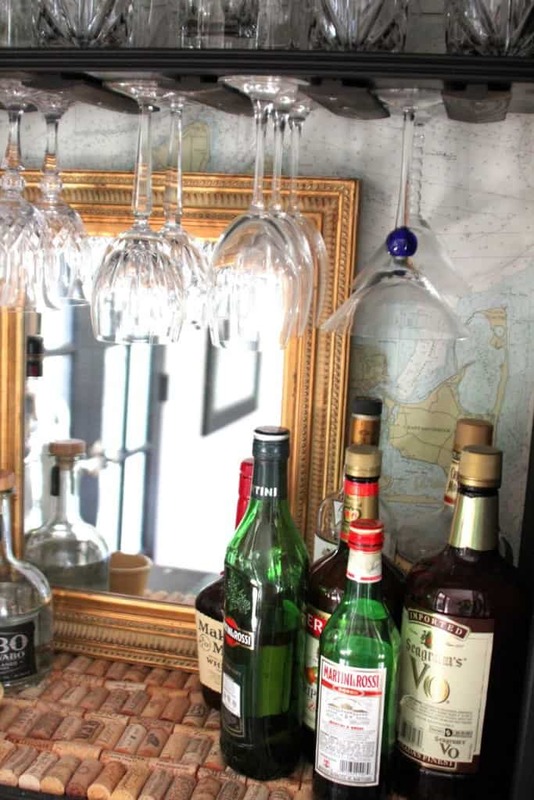 Can't believe you've managed to set this bar armoire from almost scratch – genius has its perks! CHEERS!